Language use among Hispanics in the U.S. reflects the trajectories that previous immigrant groups have followed. Immigrant Hispanics are most likely to be proficient in Spanish, but least likely to be proficient in English. In the second generation, use of Spanish falls as use of English rises. 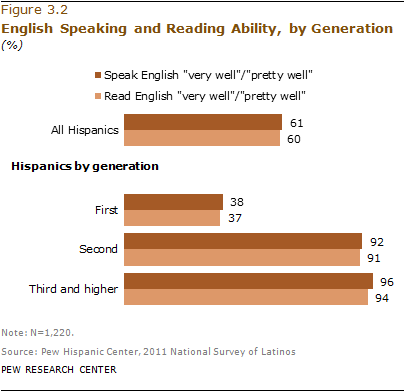 By the third generation, English use is dominant (Pew Hispanic Center, 2009; Hakimzadeh and Cohn, 2007; Pew Hispanic Center, 2004). Results from the Pew Hispanic survey reflect these patterns. Even so, while English use among Latinos is higher in later generations and Spanish use is lower, Spanish use persists among the third generation. In daily activities such as listening to music, watching television or even thinking, significant shares of third-generation Latinos use Spanish, the Pew Hispanic survey shows. According to the survey, fully 87% of Hispanics believe Hispanic immigrants need to learn English to succeed in the U.S. But at the same time, nearly all (95%) Hispanic adults believe it is important for future generations of Hispanics in the U.S. to be able to speak Spanish. 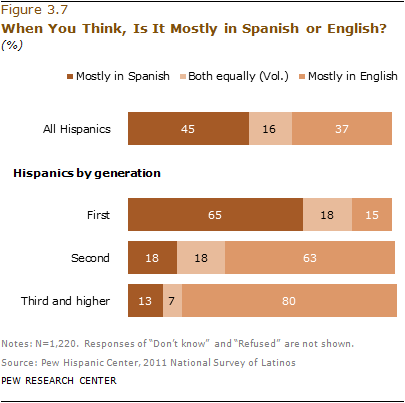 Latinos see both English and Spanish as important, though in different ways. According to the survey, when asked whether adult Hispanic immigrants need to learn English to succeed in the U.S. or if they can succeed by speaking only Spanish, nearly nine-in-ten (87%) Hispanics say adult immigrants need to learn English. Just 11% say adult Hispanic immigrants can succeed by speaking only Spanish. These figures are unchanged from 2002, when 89% of Hispanics said adult Hispanic immigrants need to learn English and 10% said they can succeed in the U.S. by speaking only Spanish (Pew Hispanic Center, 2002). When it comes to Spanish, fully 95% of Latinos say it is either very important (75%) or somewhat important (20%) that future generations of Latinos living in the U.S. speak Spanish. Nearly all Latinos, regardless of generation, agree on this point. These findings may reflect a recent shift in priorities among Hispanics. According to the 2009 National Survey of Latinos, today’s young Latinos are encouraged to speak Spanish more so than their parents were when they were young (Pew Hispanic Center, 2009). Even though nearly all Hispanics say it is important that future generations of Hispanics speak Spanish, Spanish proficiency and use is lower in later generations, while English use is higher. The survey also finds that the level of Spanish proficiency diminishes in later generations. 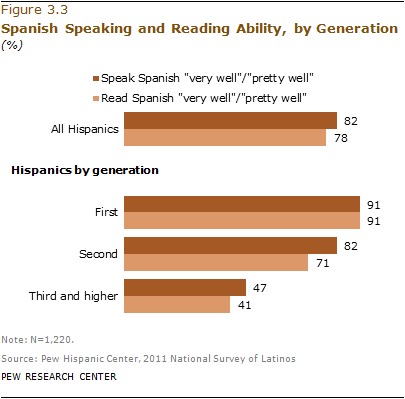 More than nine-in-ten foreign-born Latinos say they can speak and read in Spanish “very well” or “pretty well.” For the second generation—the U.S.-born children of immigrants—the share saying they can carry on a conversation in Spanish falls to 82%, and the share saying they can read a newspaper or book in Spanish falls to 71%. Among third-generation Latinos, fewer than half say they can speak Spanish proficiently (47%) or read a newspaper or book in Spanish (41%). The Pew Hispanic Center uses a measure, “primary language,” that combines survey respondent self-assessments of English and Spanish speaking and reading ability into a single measure of language ability. It is meant to summarize speaking and reading ability in both English and Spanish. Using the self-reported measures of English and Spanish proficiency in speaking and reading, survey respondents are classified in three ways—Spanish dominant, English dominant or bilingual. Respondents are classified as Spanish dominant if they say they speak and read Spanish “very well” or “pretty well” but their ratings of English ability in the same two categories are lower. Respondents are considered English dominant if they say they are more proficient in English than in Spanish. Finally, bilingual respondents are those who say they are proficient in both English and Spanish. Using this measure, the survey finds that 38% of Hispanic adults are Spanish dominant, another 38% are bilingual and the remainder, 24%, are English dominant. Which language is more dominant is a function of immigrant generation. Among immigrant Hispanics, the majority (61%) are Spanish dominant, one-third (33%) are bilingual and just 6% are English dominant. By contrast, among second-generation Hispanics, Spanish dominance falls to 8%, but the share who are bilingual rises to 53% and the share English dominant increases to 40%. 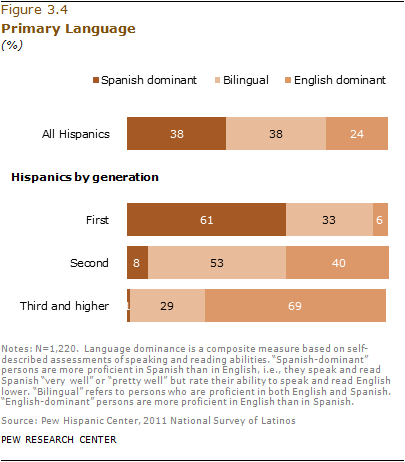 By the third generation, almost all Hispanics are either bilingual (29%) or English dominant (69%). When it comes to listening to music, 35% of Hispanic adults say they do so only or mostly in Spanish, 36% say they do so only or mostly in English and 27% say they listen to music in both languages equally. The language used when listening to music changes sharply across the generations. Among immigrant Hispanics, more than twice as many say they use Spanish compared with English when listening to music—49% versus 18%. 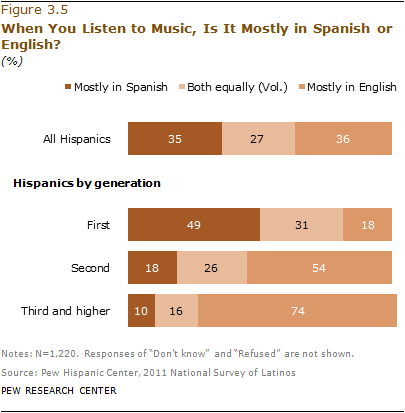 Among second-generation Hispanics, the opposite is true: More than half (54%) use English when listening to music, while 18% say they use Spanish. By the third generation, English use when listening to music rises to 74%, and Spanish use falls to 10%. Among all Hispanics, more watch English-language television than Spanish-language programs—45% versus 28%. Meanwhile, 26% say they use both languages equally. Across the generations, English use when watching television rises and Spanish use falls. Among immigrant Hispanics, nearly twice as many use Spanish when watching television as use English—40% versus 25%. One-third (34%) say they use English and Spanish equally when watching television. By the second generation, 69% of Hispanics say they watch television in English, 17% say they use both English and Spanish equally, and 12% say they watch television mostly or only in Spanish. Among third-generation Hispanics, more than eight-in-ten (83%) say they use English when watching television. Some 11% say they use both languages. And just 5% of third-generation Hispanics say they watch television mainly in Spanish. As with other forms of language use, more Latinos say they use Spanish than English when thinking—45% versus 37%. Meanwhile, some 16% say they use both languages when they think. As might be expected, use of Spanish falls and use of English rises through the generations. Among immigrant Hispanics, two-thirds (65%) say they use Spanish when they think, 15% say they use English, and 18% say they use both English and Spanish. By the second generation, use of English rises to 63% and use of Spanish falls to 18%. By the third generation, eight-in-ten (80%) Latinos say they think in English, 13% say they think in Spanish, and 7% say they think in both languages equally.